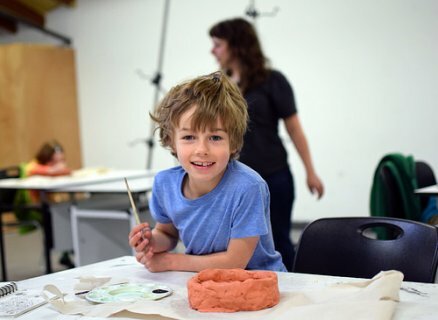 – The Crocker Art Museum will present new classes for children, teens, and adults starting this October in the Museum's fall session of Studio Art classes. All classes are led by skilled teaching artists and are designed to encourage students to unleash their imaginations while receiving formal lessons in a variety of media. Highlights for children include Saturday Kids Art Club sessions where children ages five to eight will have fun using simple shapes to create 2-D and 3-D art. At Crocker Kids Drama Club, tweens will use art as inspiration for creating dramatic skits. College-bound artists or career-minded teens can gain insight from a professional artist and participate in an authentic critique of their work in the Crocker's first Master Artist Workshop for High School Students. For adults, the Crocker will feature classes for a variety of skill levels, including drawing classes for beginners as well as introductory- and advanced-level painting courses. In iPainting, participants will discover the latest means of expression by creating art on their iPad, iPod, or iPhone. For those looking for a relaxing weekend, Breathe, Stretch, Paint combines the art of yoga with watercolor painting and perception exercises for a fresh take on the creative process. Shutterbugs can learn how to capture the perfect shot amidst the excitement in Event Photography.